A Northwest pleasure garden tucked away in a Federal Way neighborhood, the three acres of PowellsWood are nestled against another thirty-five acres of native successional forest. A series of exquisite hedges help define several distinct garden rooms graced with more than a thousand varieties of trees, shrubs and perennials. PowellsWood is a proud supporter of the home-gardening Landscape for Life approach to the goals of the Sustainable Sites Initiative. Click here for more details about PowellsWood and Sustainable Gardening. Click on the text links below to view slide shows of the garden rooms. The Entry Garden is an intimate garden room enclosed by hedged Portuguese laurels, tri-color beeches and a slope of Japanese maples; it is the perfect place to rest and wait for friends as you begin your visit. The garden features a circular planting bed with windmill palms and a series of stone birdbaths. Descending the stairs view lush sweeps in shades of green in the Fern and Rhododendron Borders. A mixed evergreen hedge serves as a backdrop for this shady peaceful garden where conifers and grasses meld with the ferns and rhododendrons. The Perennial Border is designed around a re-circulating stream and pond, which collect and filter seasonal run-off. The borders that surround them include richly colored shrubs, trees and large leaved perennials that enjoy the moist environment. Access to close up views of the stream is provided by a small footbridge. A beautifully maintained Leyland cypress hedge provides a foil for the colorful plantings in its foreground. 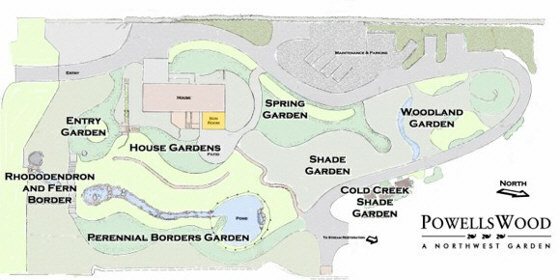 The Shade Garden marks the eastern edge of the cultivated garden. Its long arbor with several clematis and climbing roses is a lovely place to picnic in the summer. Specimen trees include coast redwoods, a golden locust and a trio of orangebark stewartia. The Woodland Garden features a mound of ferns under a canopy of Douglas firs. This simple yet stunning space serves as a gathering area for garden events. An overlook, built largely of material from a recycled pier, provides a view of the ravine, trails, and wildlife below. Graced with six mature Shirotae cherry trees the Spring Garden’s lovely lawn is dusted with delicate blossoms each spring. Striking groupings of Divinely Blue deodar cedar and Pacific Fire vine maple mark the northern end of this garden. The flowers and foliage of this garden are a photographer’s delight all four seasons of the year. The House Garden is located off the patio of the Garden Room. Sit under the umbrellas on a hot summer day and allow yourself to be transported by the bold style of this garden. Innovative color and plant combinations bring inspiration to many a gardener. Visit the Garden Room for information about the garden’s history, programs, and volunteer opportunities. You may also find Ned Gulbran’s original garden design of interest.